FBGS Series non-fray fiberglass sleeving is a flexible, high temperature primary or secondary insulation made from closely braided, continuous filament fiberglass which has been heat-cleaned to remove impurities in the yarn. 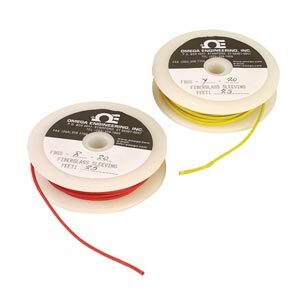 Acrylic resin binders are applied for color coding and to further retard fraying and to hold sleeving round for cutting. This fiberglass insulation is unaffected indefinitely through a temperature range from -60 to 316°C (-76 to 601°F) and withstand up to 616°C (1141°F) for shorter periods. Colors will be less vivid after exposure to 150°C (302°F). FBGS Series fiberglass sleeving is used for thermal and mechanical protection in consumer, commercial and industrial applications where flexibility, abrasion resistance or insulation is required and particularly when temperature extremes prohibit the use of other materials. Note: For non-stock lengths, please contact sales.